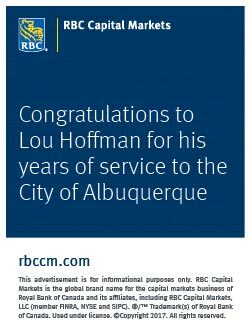 A mechanical engineer by training, who enhanced his credentials with an MBA, also from the University of New Mexico, Lou Hoffman has ample opportunity to use his diverse background as director of finance and administrative services for Albuquerque. And about that Masters in Business Administration? 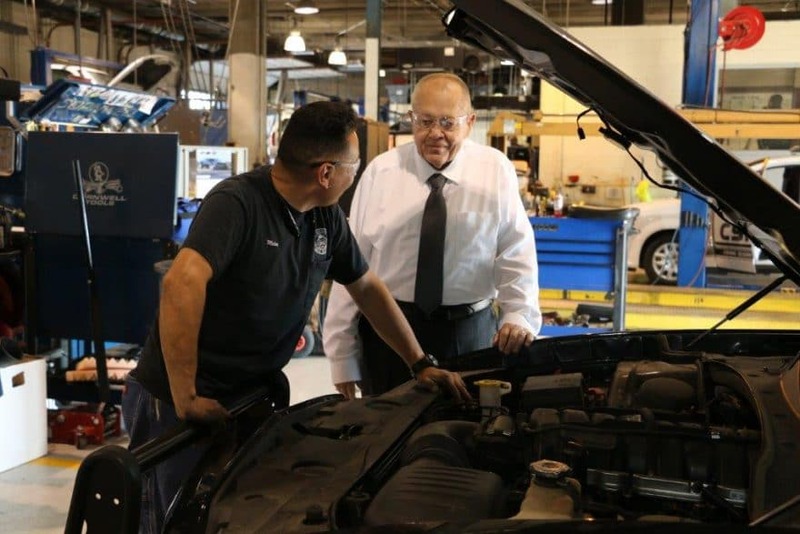 Hoffman had no shortage of problems to identify and remedy when, at the behest of new Mayor Richard J. Berry, he came out of retirement in 2009 to return to City Hall where he had served as treasurer from 1987 to 2006. Seems that Berry, who had run a construction company and has degrees in finance and administration, could also identify problems and regarded Hoffman as among the solutions. 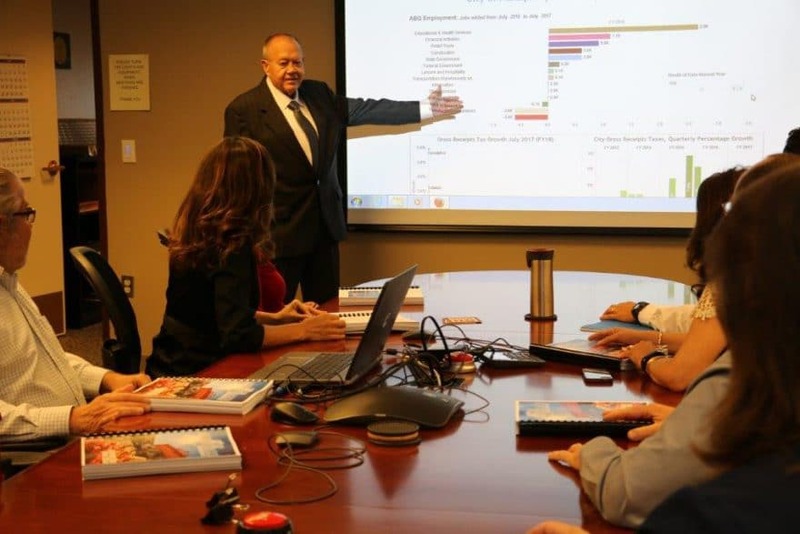 For the Great Recession had hit New Mexico’s most populous city hard, forcing reductions in municipal operations and sinking the budget deep into the red. Hoffman was put in charge of an $81 million, 300-employee department entrusted with accounting and budget, info-tech, purchasing, office services, real property, risk and cash management, investments and citywide fleet services. Eight years later, there’s an integrated financial suite in place, known as an Enterprise Resource Planning System, that takes all municipal functions—including payroll, general ledger, budgeting, purchasing, accounts receivable and payable, treasury and banking—into a system that communicates within itself. Bank and book balances reconcile without delay. Meanwhile, a new team of project managers and IT experts has taken root and thrived. During the first 18 months of the new administration—from midway 2010 to 2011—spending was reduced by $91 million. 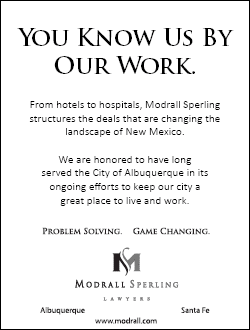 Today there are 117, or 2 percent fewer, municipal employees, and Albuquerque’s admirable bond rating—Aa1, AAA and AA+ by the big three of Moody’s, Standard & Poor’s, and Fitch, respectively, has been sustained. The so-called Duke City of the Great Southwest, can again feel comfortable moving forth with other initiatives. The city’s efficiency in handling retiree benefits also is held up as a municipal model. 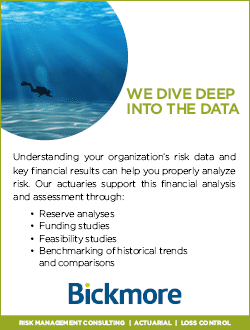 While most agencies, especially 10 years ago, chose to simply report liability in their financial statements, Albuquerque engaged the services of the Portland, Oregon-based Bickmore firm to prepare an actuarial analysis of this liability. Under Hoffman’s guidance, the city pursued options for securing these benefits by setting aside assets to be applied toward future payment. While this pursuit initially came in the form of earmarking reserves within the city’s treasury funds, with Hoffman’s encouragement, the finance staff explored the setup of segregated trust account dedicated exclusively to accumulating the funds needed to finance their retiree life insurance benefits. These efforts required working with the state for approvals to establish such a trust and to enable the city to expand the typical asset investments typically available to them. The city’s retiree life insurance trust not only improves the security of these promised benefits for the retirees, it also reduced the unfunded liability for the city in its financial statements and helps prevent the transfer of this liability to future taxpayers who may never receive any services from the employees who will receive the benefits (improved taxpayer equity). In just the past five years, the city has accumulated over $16 million and improved the plan’s funded position from nothing to about 29 percent. “We have been impressed by and pleased to work with Mr. Hoffman and the city’s finance staff on this benefit program for their retirees,” says Catherine MacLeod, director of post-employment benefit actuarial services for Bickmore. Sustainable practices has become a buzz term of sorts in the public sector, sometimes seemingly pursued for the sole reason of satisfying some constituency, but with little or nothing tangible to show for the efforts. That’s not the case in Albuquerque, which, as of early fall, had sold $25 million in clean renewable-energy bonds that Hoffman sees as a move that’s both fiscally and environmentally sound. “We expect a payoff that will more than cover the costs,” he says. With Albuquerque also blessed with abundant sunshine—3,415 shining hours annually claimed by this scenic, high-desert locale—the city harnesses that gift from above in multiple ways, including solar features on parking facilities, cool roof installations and thin-film solar panels. Some projects are covered by federal subsidies. A major power source returns energy to the grid to reduce costs at the local airport. “The first 3 percent of our annual capital program are also set aside for energy-efficiency initiatives that are more than self-sustaining,” Hoffman tells Vision. As he spoke, the Citelum Group was at work on a multiyear project converting Albuquerque’s street lights to energy-efficient LED fixtures, an investment that Hoffman and Berry believe will save the city millions of dollars annually in energy and maintenance costs. LEDs also allows for brighter lighting in high-traffic areas and muted illumination where it’s not so vital. Whatever the brightness, LED’s life expectancy exceeds that of traditional street lights, adding up to more savings and a smaller carbon footprint. Hoffman would like to see more happening with wind power, the National Renewable Energy Laboratory calculating that New Mexico has the potential to generate far more capacity than it consumes. That said, there are always siting and technical issues. “It would be inappropriate for me to impose my judgment on what the energy folks want to do, but my background does give me insight to ask the right questions,” Hoffman says. As to how long Hoffman may be asking questions and rendering advice, well that—like most anything in public life—is uncertain. 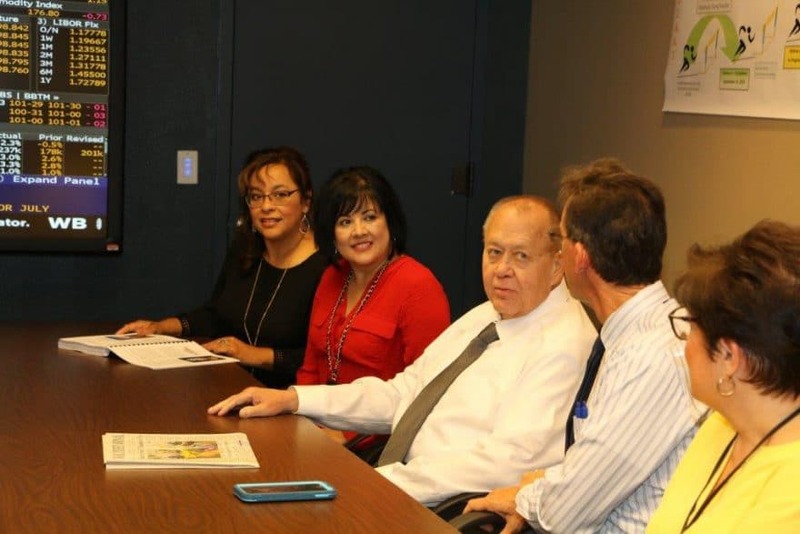 Mayor Berry, whom Hoffman regards as the most capable municipal boss he’s worked with over the course of four decades-plus in New Mexico, as well as Nevada, isn’t running for a third term. “I’ve informed the candidates I’d be happy to remain, if wanted,” Hoffman says. Outside his municipal duties, Hoffman has found ways to build a better community. A military history buff, Hoffman was in Italy this past autumn and, despite a recent back injury, was able to walk up to 5 miles daily, exploring historic sites from Sicily to Rome. In 1991, he founded the New Mexico Veterans Memorial Park in Albuquerque— sustainably maintained, he says, unlike Grant’s tomb. In addition, he has written vivid accounts ranging from the Spanish conquistadors’ settlement in New Mexico, to the service and sacrifice of the region’s veterans in Vietnam that comprise permanent exhibits at the Veterans’ Memorial. Whatever happens, Hoffman won’t be disappearing from the city where his ancestors settled in 1880. If, indeed, Hoffman finally leaves City Hall later this year, it’ll be in far better shape than when he re-emerged there nearly a decade ago. Locals may take comfort knowing that even if he saddles up into Albuquerque’s magnificent sunsets, his advice will be just a phone call away.